In ‘Ramayana‘, the world’s oldest epic poem, Kumbhakarna is referred as Ravana’s younger brother. 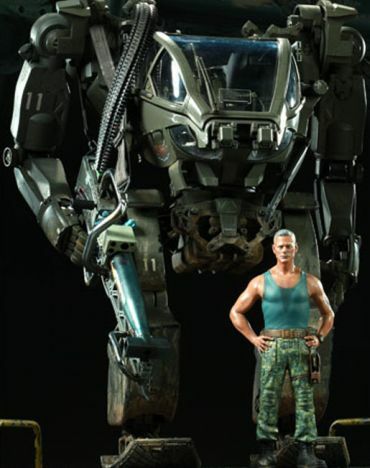 But he was not a living being at all, but a ‘Yantra‘ (machine/robot) which had a gigantic appearance (like a giant robot). To be more precise, Kumbhakarna was an ancient robot, fearsome more-machine-and-less-human-like ‘humanoid‘. Ravana used Kumbhakarna sparingly, meaning, only during very difficult battle-situations, and it instantly turned the tide in Ravana’s favour. May be due to its high maintenance, it was made to sleep for a period of about six months and awakened only when need arises or when it has to be re-fuelled. Translation : It is sure that you were created by visravasa for the destroyal of people. On that account, you will be sleeping apparently dead from now onwards. Here, he clearly uses the word ‘nirmitaH‘, which means ‘built/created‘ by Visravasa, who was Ravana’s father. When Kumbhakarna was approaching Vanara Army and crushing them under his toes, they started to runway in fear. Then Ravana’s brother Vibhishana reveal the truth of Kumbhakarna to Rama and his army. Translation : Let all the monkeys be told that it is a kind of machine, advancing forward. By knowing this, they can become fearless by now. Translation : Hurled by Kumbhakarna in his mouth which was looking like a hole in the earth, the monkeys again came out from his nostrils and ears. How can person enter into a gigantic person’s mouth and come out of nostrils and ears, unless the giant is a machine with no internal anatomy ? But in same Ramayana, it was clearly stated that Kumbhakarna was married with Vajramala and had kumbh, nikumbh as sons. These sons were killed by Hanuman. So, Kumbhakarna must be an alive brother of Ravana, who operated a giant robot from its inside (like the AMP suit in Avatar movie). So the robot was known with the same name of its operator. Infact Kumbha-Karna means the one who has pot(kumbha) like ears(karna). 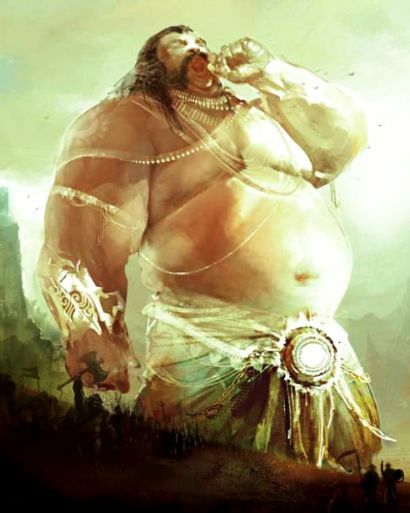 Rama used Vayuvyastra (a wind forced missile) to cut-off Kumbhakarna’s arm and later chopped its head. When Kumbhakarna was shot down by arrows of Rama, he died and the robot which had nobody to control it, fell into the sea. Upon knowing the death of Kumbhakarna, Ravana and his sons wept. Hearing that their paternal uncle was killed; Devantaka, Narantaka, Trishira and Atikaya were afflicted with sorrow and wept. In later (mis)translations Kumbhakarna has been (mistakenly) thought to have been a gigantic demon, while the Vanaras have been turned into monkeys. Infact Vanaras are humans with tail. Vaala(tail) + Nara(human). They were three in number and were named as Dama, Vyala and Kata. Kata was like a modern tank protecting army. The word ‘Kat’ means to go, to cover. It could go and cover the army so the name. The name ‘Dama’ is derived from the root Dam which means to tame, subdue, conquer, restrain of course the enemy. ‘Vyala’ means vicious, fierce, cruel, savage like tiger or snake. Those three Robots were lifeless machines and therefore had no sentiments, no emotions, so they were never defeated. They always won the wars against Adityas (gods). So Adityas played a trick to induce sentiments and emotions in them. They fought with the three Robots and ran away, many times,with defeat. This induced Ego in the Robots. Ego arised as the robots were thinking due to artificial intelligence. At the same time Adityas talked to them and told that because of their valour Sambarasura wins and enjoys his life at their cost. This added emotions and sentiments. They felt that they should also enjoy their livesYoga Vāsistha describes application of Artificial Intelligence (A.I), human emotions, ego to Robots. Sambarasura creates dama, vyāla, kaTa to win on Adityas.